Paralingual design gives equal weight to two languages on web pages that serve multilingual populatins. Convince the team to create a paralingual page. Challenges: Some members of the team were not receptive to the idea. Great work writing—superb work of thinking strategically BEFORE writing. Clearly, you ask yourself — and others! — "What is best for the Guest?" 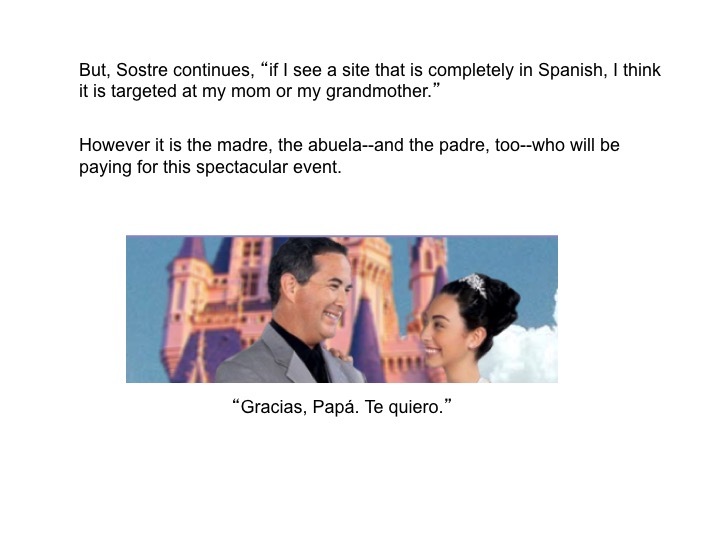 My assignment: write the copy for the Disney Parks quinceañera page—which would link to disneyworld.com and disneyland.com. Once you write the word quinceañera once, with the énye in place, it becomes clear more of the page should be in Spanish. Maybe all of it? Better yet, half of it. Research suggests third-culture kids are more comfortable with English, but their parents may not be. Since the parents are paying the bill, why not offer a page for both Guests and both languages? Why not offer the opportunity for co-browsing.